ISU music alumnus David Darling has been awarded a 2010 Grammy Award for Best New Age Album. His award-winning release, "Prayer for Compassion," a musical call for worldwide peace and understanding, is the result of Darling's 10-year collaboration with long time producer and friend Mickey Houlihan of Wind Over the Earth Records. 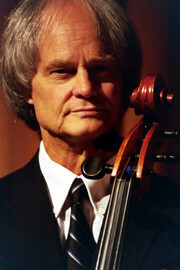 This is Darling's second Grammy nomination, having been previously nominated in 2002 for his solo, self-produced CD, "Cello Blue." Darling, a cellist, spent 17 years as a member of the Paul Winter Consort, which blended jazz, classical and world music with, at times, voices and sounds of nature. He retired from the Consort in 1987 to explore solo performance, teaching and recording. Since 1986, Darling has been active with "Music for People," an internationally recognized non-profit educational network he co-founded, dedicated to teaching and fostering music improvisation as a means of creative self expression. He has traveled extensively for over 40 years enthusiastically encouraging all humans to explore their musical talents and creative abilities, performing at concert venues such as Lincoln Center, The Kennedy Center, Carnegie Hall and Queen Victoria Hall. Darling, an Elkhart native, began piano lessons at age 5 and studying the cello at age 10. He received bachelor's and master's degrees in music education from Indiana State University in 1963 and 1968. He taught in Evansville elementary and secondary schools before going to Western Kentucky University. He currently resides in Goshen, Conn., creating music in his home studio, Camp David Recording Studios. ISU music alumnus David Darling has been awarded a 2010 Grammy Award for Best New Age Album.